California State University, Long Beach (also known as Cal State Long Beach, Long Beach State, CSULB, LBSU, or The Beach) with nearly 40,000 students and faculty, covers 323 acres and was built over the village of Puvungna in 1949. CSULB is the largest campus of the California State University system and the second largest university in the state of California by enrollment. MARCH 10 – 11, 2018 – RAIN OR SHINE! Presented by the American Indian Studies Program , American Indian Student Council, American Indian Student Services, Division of Student Affairs, Student Life and Development, and Associated Students, Inc.
California State University, Long Beach’s annual Pow Wow, an American Indian social celebration, returns to the campus’ central quad on Saturday and Sunday, March 10 – 11, 2018. The largest spring event of its kind in Southern California, the Pow Wow at Cal State Long Beach is focused on displaying the university’s strong American Indian presence. Admission and parking are free. We strongly recommend spectators to bring folding chairs. The two-day event, which will feature American Indian dancing, arts, crafts and food begins at 11 AM each day and runs until 10 PM on Saturday and 7 PM on Sunday. In addition to contests and inter-tribal dancing, there will be Gourd dancing with Dancer Registration closing at 2 PM on Saturday, March 10. All dancers and drums are invited. Native foods such as mutton and beef stew, Navajo tacos, fry bread and Indian burgers will be on sale at the event, and American Indian vendors will be selling both traditional and contemporary American Indian art. A campus map and directions can be found at www.csulb.edu/map or you may download a Pow Wow Campus Map. Head Man, Dr. Casey Fox, and his family are sponsoring a 2018 Royalty Special! The contest is open to any former and current Pow Wow Princesses 18 years of age and older (traditional, jingle, and fancy – must register for Special and be in full regalia). A campus map and directions can be found at www.csulb.edu/maps. California State University, Long Beach’s annual Pow Wow, an American Indian social celebration, returns to the campus’ central quad this Saturday and Sunday, March 7 – 8, 2009. The largest spring event of its kind in Southern California, the Pow Wow at Cal State Long Beach is focused on displaying the university’s strong American Indian presence. Cal State University Long Beach is the present-day site of Puvungna, the sacred ancient village. The two-day event, which will feature American Indian dancing, arts, crafts and food begins at 11 AM each day and runs until 10 PM on Saturday and 7 PM on Sunday. In addition to contests and inter-tribal dancing, there will be Gourd dancing with Dancer Registration closing at 2 PM on Saturday, March 7. All dancers and drums are invited. The Pow Wow is co-sponsored by the American Indian studies department, the American Indian Student Council, the Native American Alumni and Friends Chapter, the Division of Student Services, Student Life and Development, 49er Shop Inc. and Associated Students Inc. Admission and parking are free. We strongly recommend spectators to bring folding chairs. For more information, visit http://csulb.edu/powwow or contact Anna Nazarian-Peters at (562) 985-8528. You can also reach the event organizers by email at powwow@csulb.edu. The Daily 49er, the student newspaper of Cal State Long Beach, publishes an editorial on the forgotten history of the school’s mascot, Prospector Pete. Read the editorial Here and give us your opinion. 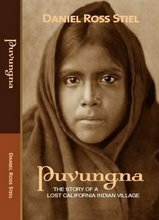 Baker & Taylor, the world’s largest book and entertainment distributor, has made Puvungna, the new novella by Daniel Ross Stiel, available for sale to libraries, bookstores and suppliers worldwide. In business for 181 years, Baker & Taylor is the wholesaler of choice for retailers and libraries worldwide because of their commitment to providing quick delivery, high fill rates, useful selection tools and responsive customer care. Browse their website to learn how Baker & Taylor serves different markets with a variety of exclusive programs and services. Due to popular demand, the author is making autographed copies of the first edition of Puvungna available for purchase. For more details, see the special listing on eBay.com. This special offer includes free shipping to the U.S. (shipping worldwide is also available) for just $12.99. To order, Click Here or go to eBay (search for Puvungna). Puvungna, the novella written by Daniel Ross Stiel is now available for reading at Amazon.com. Puvungna is a story about two young brothers who travel back in time and discover an ancient Indian village along the shores of a Southern California beach and the secret behind its disappearance over five hundred years ago. Puvungna was inspired by the true story of a long-forgotten village that was once populated by the indigenous Tongva people of Southern California. Today, the last remnants of the village of Puvungna is located near the Pacific Ocean on the campus of present day California State University, Long Beach. To review or order Puvungna on Amazon, Click Here.